Improved Characterization and Modeling of Tight Oil Formations for CO2 Enhanced Oil Recovery (EOR) Potential and Storage Capacity Estimation. The DOE award is valued at $2,000,000, with additional cost share of $500,000 from the North Dakota Industrial Commission. The project manager is Jim Sorensen, Senior Research Manager. The project will determine the viability of tight (<10 mD), unconventional fractured oil and gas reservoirs to store CO2 during enhanced oil production and develop methods to better detect and characterize small pores and fracture networks within them. Identification of Residual Oil Zones (ROZs) in the Williston and Powder River Basins. The DOE award is $2,499,671, with in-kind cost share from Schlumberger valued at $4,006,327—for a project total of $6,505,998. 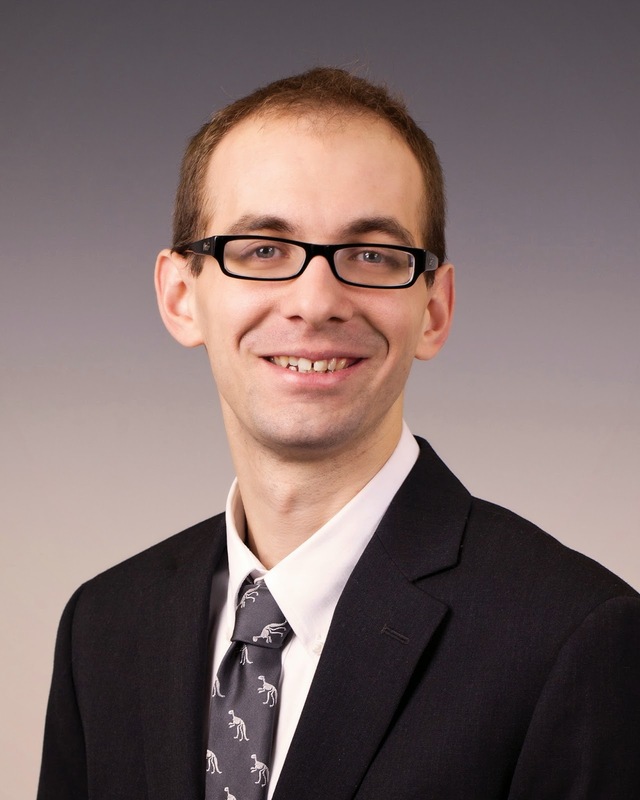 The project manager is Charlie Gorecki, Senior Research Manager. The project aims to identify the presence, extent, and oil saturation of ROZs, estimate the oil in place and the CO2 storage potential, determine the feasibility of EOR, and develop a robust and repeatable method for identification of ROZs in other sedimentary basins. More: EERC Center for Oil and Gas. Matt Burton-Kelly is a Research Scientist at the EERC, where he develops geophysical models of the subsurface, performs regional geological characterization, and manipulates data within geographic information systems (GIS). He holds Ph.D. and M.S. degrees in Geology from the University of North Dakota and a B.S. degree in Geology from Saint Lawrence University, Canton, New York. “I enjoy that the work at the EERC has immediate meaning in ‘the real world.’ Although I enjoy science for the sake of learning more about the history and evolution of the world, it’s nice to work on projects that have a measured impact,” said Burton-Kelly. Burton-Kelly’s principal areas of interest and expertise include stratigraphy and sedimentology; paleogeography; CO2-based enhanced oil recovery; data management; data sharing among researchers; and invertebrate paleontology, including freshwater mussels and arthropod trace fossils. “Continued collaboration among researchers will have a very positive impact in producing more accurate paleoenvironmental reconstructions. I’ve published on arthropod trace fossils (the tracks were left by critters similar to horseshoe crabs on an ancient beach) and have a few papers in the works with Joseph Hartman, my M.S. and Ph.D. advisor at UND, on freshwater mussels in North Dakota and Montana,” said Burton-Kelly. Burton-Kelly enjoys riding bicycles (road, gravel, mountain), running, working on his house, and reading. As a graduate student, he competed in cycling for UND one season. He volunteers for Extreme North Dakota Racing (endracing.com), where he has been in charge of the Web site, online race registration, and online marketing, along with race planning and race-day logistics. Burton-Kelly also manages the Web site for Ground UP Adventures (GUP), a nonprofit whose goal is getting kids into the outdoors and endurance sports and volunteers for GUP’s related projects, Northern Heights Rock Gym and Boathouse on the Red. Burton-Kelly’s wife, Alison Kelly, is an Assistant Professor of Psychology at UND. EERC staff gather for annual photo. Click to watch the time-lapse video. 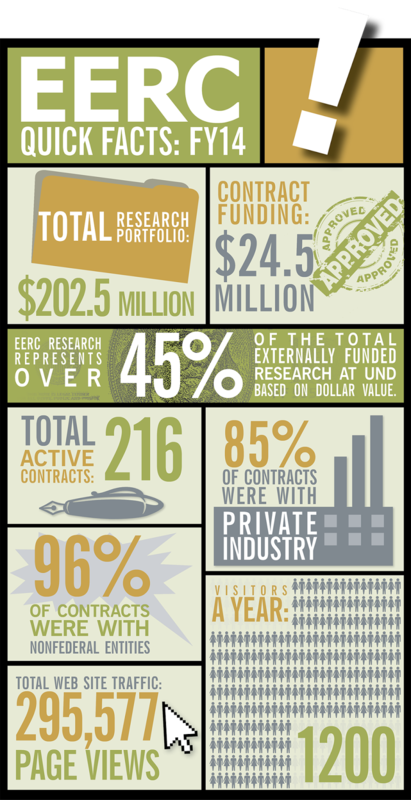 The Energy & Environmental Research Center (EERC) recognizes that our region is abundant in energy, agriculture, and human resources. Technological integration of our natural resources through scientific research and development is necessary to meet the economic and environmental challenges of our generation and the next. By integrating these resources, we can help meet the world’s growing demands for energy and food through the creation of next-generation energy technologies capable of producing clean power, liquid fuels, and chemical fertilizers and products. The integration of these technological developments and approaches will continue to grow the region’s vibrant economy, establish our region as a leader in sustainable energy development, and provide solutions that can be replicated, in part or in whole, throughout the world. The EERC is leading one of the world’s largest programs dedicated to developing and demonstrating technologies to reduce CO2emissions to the atmosphere from large-scale sources. The PCOR Partnership, made up of more than 100 private and public sector members, is providing data, guidance, and practical experience with carbon capture and storage. The PCOR Partnership region includes all or part of nine states and four Canadian provinces. The PCOR Partnership is one of seven regional partnerships operating under the U.S. Department of Energy National Energy Technology Laboratory’s Regional Carbon Sequestration Partnership Program. The EERC’s PCO2C Program is demonstrating commercially viable CO2 separation and capture technologies for fossil fuel- and biomass-fired systems. Working with leading companies in the CO2 capture area, the PCO2C Program is providing key technical and economic information that can be used to examine the feasibility of those technologies for commercial deployment. The EERC is working with top producers in the oil and gas industry to improve oil recovery in the Bakken system while at the same time reducing its environmental footprint. The program is providing critical solutions for flaring, water, NORM (naturally occurring radioactive material), reclamation, and spills and other wellsite productivity issues affecting all Bakken producers. Nicholas Bosshart is a Research Scientist at the EERC working with the Oil & Gas Group as part of the Modeling and Simulation team. He develops geophysical reservoir models for hydrocarbon resource assessment and geologic CO2 storage analyses. Originally from Iowa, Bosshart earned a B.S. degree in Geology from the University of Northern Iowa and an M.S. degree in Geology from the University of North Dakota, specializing in Petroleum Geology. Bosshart’s principal areas of interest and expertise include well log, core, and thin-section petrophysical analysis; geologic characterization and data management; geostatistical applications; geocellular reservoir modeling; enhanced oil recovery utilizing CO2; geologic storage of CO2; and 3-D seismic interpretation. An Army veteran, Bosshart will complete an 8-year stint with the U.S. Army National Guard in the fall of 2014. He was deployed to the Sinai Peninsula in Egypt for over a year as part of the Multinational Force and Observers, an international peacekeeping force overseeing the terms of the peace treaty between Egypt and Israel. Bosshart’s hobbies and interests include spending time outdoors and staying active through hiking, bicycling, traveling, and woodworking. 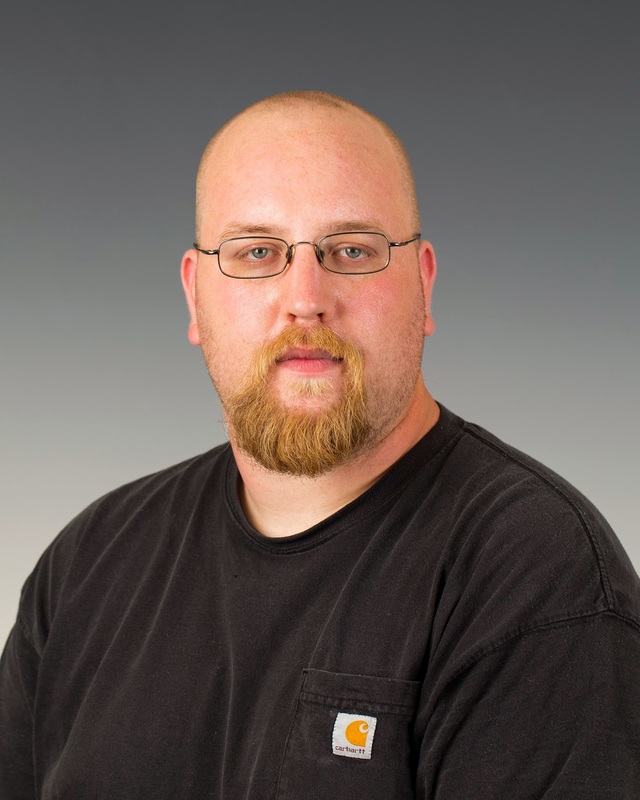 Steve Schaefer is a Technology Development Machinist at the EERC, where he operates machining equipment; develops alternative methods of machining; and designs, fabricates, installs, and repairs specialized equipment in support of multiple EERC projects. “What interests me most about this job is the variety of work I get to do here as well as being involved with multiple aspects of any given project that I am working on,” said Schaefer. Schaefer holds an Associate of Applied Science degree in Machine Tool Technology from the North Dakota State College of Science in Wahpeton, North Dakota. Before coming to work at the EERC, Schaefer worked as a tool and die maker at Tillman Tool and Die in Breckenridge, Minnesota, and a CNC (computer numerical control) mill programmer and operator at Northern Valley Machine in East Grand Forks, Minnesota. “I enjoyed the tool and die work because of the extreme detail and precision it requires, and I liked the CNC job because it required me to always think of new ways to make parts as it was almost completely prototype work,” said Schaefer of his previous jobs. Schaefer likes to hunt, fish, and shoot long-range rifles. He plans to start competing in long-range marksmanship competitions in the future. The Energy & Environmental Research Center (EERC), in collaboration with the University of North Dakota (UND) College of Engineering and Mines (CEM), presented an Energy Research Day on Thursday, September 4, 2014. Energy Research Day was an opportunity for UND students, faculty, and staff to learn about current CEM and EERC projects and to explore the potential for collaborative activities regarding energy-related research. 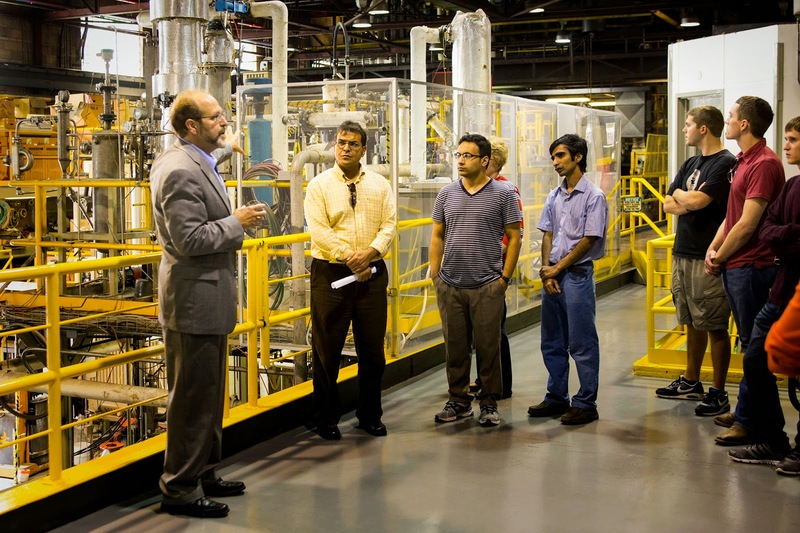 The Energy Research Day featured tours and project exhibits at CEM and the EERC. 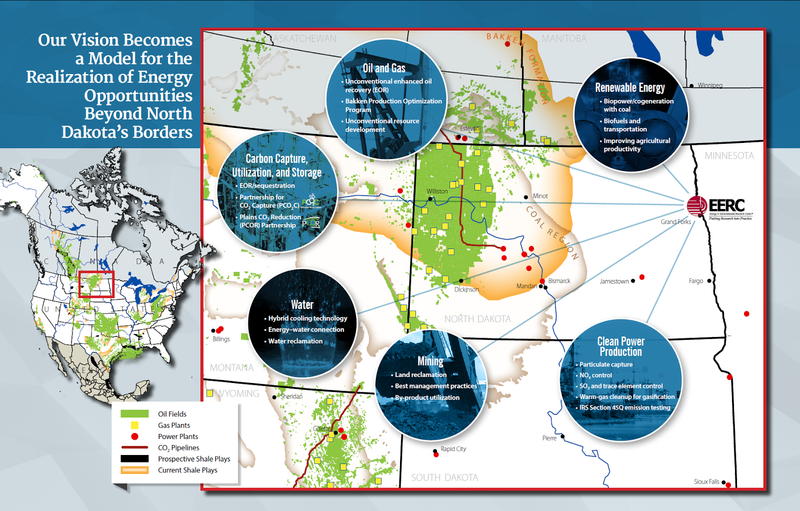 Areas highlighted included the EERC’s Bakken Production Optimization and Bakken CO2 Enhanced Oil Recovery Programs, the Plains CO2 Reduction Partnership Program, analytical and physical characterization for the petroleum industry, the Natural Materials Analytical Research Laboratory, and renewable energy activities. The CEM featured the CACHYS CO2Capture Program, the autolab for testing of cores for oil recovery, the energy and environmental test facilities, and the Advanced Material Characterization Laboratory. More than 100 people from around the campus community participated in the events. For more information, contact Derek Walters.